The Hatter, the Hare, and the Dormouse had it right, you know. How did I arrive at this literary source material? By way of a friend who shared this image with me, which I now share with all of you. 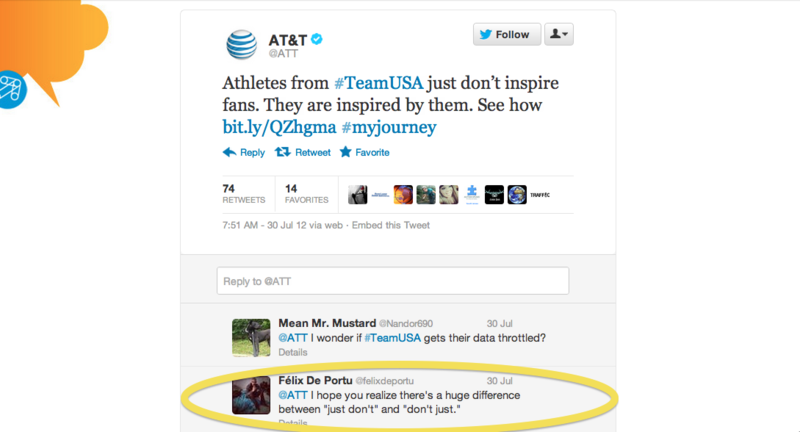 No word on whether AT&T responded to this with a corrected Tweet or not. I could hope, but I won’t. I’m reminded of a handout I created during my tenure at TSR, Inc. about how word order changes meaning. The word “only” isn’t much of a word, really, having a mere four letters and two syllables–but watch how the sentence meaning changes with the position of this lowly modifier (it can be an adjective or an adverb or even a conjunction depending on placement). Perhaps I should send this to AT&T’s social media peeps. Then again–naah. I need the blog fodder, y’know.